HostUS is a registered company in Scotland and is registered as HostUS Solutions Limited. They have been featured on LowEndBox twice before and reviews have been positive. The hardware in Atlanta and Las Vegas consist of dual Intel Xeon L5639 CPUs, 144GB of RAM, and 4x 1TB or 2TB hard drives in RAID10. I haven’t been given details on the hardware in Dallas, but it should be something along these lines as well. IP SWIP is available; please submit a ticket after ordering to do that, and include either your ORG-ID or the organization name you would like to have listed. All IPs are direct allocations from ARIN, so in case a move is ever needed, the IPs go with you. As usual, feel free to share your experiences in the comments! HostUS accepts Skrill, PayPal, credit cards through PayPal, and bank transfer for payments. However, PayPal is the primary option and you should contact them for bank transfers. They offer a 3-day money back guarantee. Their Terms of Service is something you should definitely read before you order! I visit your website and found price 15$ not 10$. Please explain about your promo, use coupon code or no? Should be $10/year which has been resolved now. The 768MB offer appears to be $15/year, not $10. You will be given a new IP. Our IP blocks are normally clean, however if it was blacklisted we can give you a new IP. If, at the point of cancellation IP is found to be spamlisted by gmail, will you pay penalty fee! Really want a 768MB yearly in Las Vegas :(. Las Vegas and Atlanta are currently in stock. Dallas is sold out, we’re working on adding stock asap. when dallas stock will available? will this offer stay untill dellas is restocked? Are there any slot in LA for 6GB VPS? Yes, we have plenty of stock in LV! He was asking about LA not LV. I am interested in a west coast location as well. Although I don’t know for sure, I’d bet Dallas or LA is better than LV. Is this life time offer? Yes, this discounted price is for life. What about (not exiting) I2P? Please note that there may be a delay of 0-4 hours for set up. Hi, I noticed in the terms that Minecraft is not allowed on the OVZ but is allowed on KVM. I could not find any offers for KVM. Is there any way that I could be allowed to run minecraft on the 6GB? Sorry – we don’t typically allow mine craft on these plans due to the I/O abuse normally caused. All 3 IPv4 are available immediately after ordering or I will receive only 1 IP and I have to order another addresses by submitting ticket? Also, in shopping cart I see “4 vCPU Cores (Fair Share)”, and in your offer you wrote “3 vCPU cores”, what option is correct? > All 3 IPv4 are available immediately after ordering or I will receive only 1 IP and I have to order another addresses by submitting ticket? We assign one IP on VPS creation and the rest can be claimed automatically from our control panel by providing IP justification. >Also, in shopping cart I see “4 vCPU Cores (Fair Share)”, and in your offer you wrote “3 vCPU cores”, what option is correct? You will get 4 vCPU Cores. I see that a CPU core has been decreased from the previous offer. Anything else has increased ? We are constantly change plans and upgrading our network/hardware. That is what I am asking. Have you increased/upgraded anything in this offer compared to the previous one ? Or the plan has just been downgraded ? There is actually 4 CPU’s in the 6GB Plan, the 3 CPU’s is a mistake on the offer. Don’t feed into this guy. He was severely deprived as a child and now in his teens, he thrives off of any attention he can get. We should ignore him and talk like he’s invisible to us. Bought one of these last night. Had some issues with the memory allocation on my VPS. After about 7 hours and 6 or 8 OS reloads (I lost count) I finally gave up and submitted a ticket. At the time I was thinking I would be waiting a day or so because of the holiday. I was wrong. First reply by them was in 8 minutes on a very early Christmas morning, 4 AM CDT! Had to paste some error logs and other info to show the issue but after they updated some settings they had the issue fixed. Total ticket time was about an hour. Excellent customer service and the VPS is running great! Dem people only give us blacklist IP, and refuse me refund! This is a false statement as we have not received any refund requests due to blacklisted IPs since this offer was posted. Just wanted to say that the IP’s I received were all clean. What’s the normal price of the 6GB plan, i.e. after the first quater? Is ip6 will be available in las vegas soon? We should have IPv6 in LV in about a week. still no ip6 in LV ..
Tor relay (not exit node) is not forbidden in the T&C. So it’s allowed? i ordered couple of hours ago, now my server up and running. how long this special offer are going to last? Glad you’re happy, this will run for 2-3 weeks. If I decide to continue service after my term is up, will I get to keep the same arrangement at this price? yes, the price will never change if the service is active. Great, if it works well,maybe i’ll order more. DO you have plan to offer service in europe ? Is it possible to order a VPS without having a “hostname”? You can use a FQDN or a single word for hostname. It is not possible to order a VPS without having a hostname. can you please post the benchmark for 768MB VPS please ? any one can tell me about their server quality. Please see the benchmarks posted in the comment above. Very happy with what I am seeing so far. We will have Dallas stock soon, just waiting for hardware to arrive. Las Vegas had been rock solid for us. Alex, how much is 1 TB bandwidth addon? Please create a sales ticket with the plan/location it would be for. A little question – are well-behaved IRC bots/bouncers (ZNC with some scripting) allowed (for things like keeping an eye on a support channel in IRC ) ? Okay, got response from support – ZNC is okay as long as it does not misbehave and/or consume too much resources. Sorry, are those offer SSD or HDD? I bought one, but the installation seems to be long, slower than my Vultr speed. These are HDD offers. Please submit a ticket for any issues. Do you accept bitcoins as payment? The link to the Texas looking glass is broken, it’s pointing to lowendbox.com/whatever instead of the actual website. Please submit a ticket so we can look into the issue. None of our nodes are overloaded. My IP is banned from the client area of hostus.us after ordering the VPS, and I received the refund and I don’t know what happen at all. We may cancel and refund orders when they do not go past our manual verification. 10$/year is a good deal. But it’s Linux. Do you have VPS Windows in stock? We do not offer Windows VPS’es. Will you have more stock in Dallas soon? I’ve already purchased Atlanta and Las Vegas, but would like to utilize a third location. I purchased a $10/year Atlanta VPS yesterday night, but my order has been cancelled (not from my side). I have no idea why (I do got the refund, though). This VPS allow torrent or seedbox?? Hello Alexander, I have a snapshot file of a server that was created at another host. Can you restore it to a new 768MB VPS at HostUS? If so, how does this work? Do I start by giving you the URL to the snapshot file so you can download it from my server? Or will you give me a FTP URL so I can upload it to your server? We can restore a vzdump – please create a ticket under your account. Okay, I will buy the VPS now, thanks Alexander. Is installing my own VPN server allowed? Yes to both, and we have TurnKey templates for OpenVPN and OwnCloud. Is this deal over. I can only find $25 on the site. Both plans are still available. Please create a support ticket and we will have a look at your script. New account provisioned within 5 hours. Thanks! Tested a 4 core VPS yesterday. Ordered 3 more this night. And now I’m ordering 8 more. They are really stable…! Ordered a week ago, took only 40 minutes to provision my host at 10am GMT. Rebuilds are fast and easy via web site, no performance problems so far so I’d say excellent value for money. Seems very strange to limit additional IPv6 addresses to 3 and to require justification for each, IPv4 I could understand but IPv6 is a virtually unlimited resource! More IPv6 addresses can be requested by sending a ticket. I appreciate I can request more addresses, but why should it be necessary? You/HostUS have 309 septillion addresses in your /44 assignment, you could assign one out every second of every day for the next 9.8 quintillion years, assuming the universe doesn’t end beforehand… The whole exercise of justifying and individually serving out IPv6 addresses seems to most pointless task in the history of wastes of time, in business terms that’s just pure costs on your end and the customer’s. i have ordered vps $10/year so far so good. i use it for my vpn. This site is a total fraud. The paypal transaction went through but I got no service at all. If you have any reason to think an order shouldn’t be approved, there is no reason to accept the Paypal transaction at all. We will be adding additional stock for the 768MB plan once we receive new servers. I been waiting for new stock to be available at Texas, bot so far I havent had any luck. Do you have any ETA for stock? We don’t have an ETA unfortunately. We are working on both. Please submit a ticket if you are looking to purchase the 768MB plan. ArchLinux can be installed on request. Any idea if Dallas server is going to be restocked with this offer? There will not be any Dallas stock in the next few days, sorry for the inconvenience. Can I sign up for LV now and transfer to Dallas when it becomes available? Ordered the 768MB service and was up and running in under 45 minutes. I’ve had uptime issues on some of the VPSs I’ve gotten from LEB, but this has been up and running ever since I did my final start. Only problem I’m having is that they’re out of stock and I can’t get any more! Very happy with service so far. Glad you are happy! Please submit a ticket if you want to order more 768MB VPS’es. I ordered a 768MB VPS (Atlanta) and it was available within in an hour. My VPS is running for almost 3 weeks now and it has a 100% uptime. I had to submit a ticket and they responded very quickly. Good price, good service, good VPS, so I have nothing to complain about. Keep up the good work guys. I ordered a 768MB VPS (Atlanta) and it was available within an hour. My VPS is running for almost 3 weeks now with 100% uptime. I had to submit a ticket and the responded very quickly. This isn’t instant provisioning. I was hoping to start development right away but am stuck waiting for the server to be created. Not sure of the service yet, hopefully they reflect the great reviews here. We manually review all orders, sorry for the inconvenience. why do you just give 4Xipv6 addresses? why not a ipv6/64 block? Most users prefer using IPv4 and our IPv6 traffic is much less than our IPv4 traffic. More IPv6 addresses can always be requested for free. Mainly due to the fact that they are DDoS prone and they hog lots of computing resources. Another new account provisioned in around 3 minutes, speed close to what was posted by Nick. Around midnight EST support enquiry was answered in less than 5 minutes. Let’s hoe that the server will be stable. Keep up great work, guys! I’m really interresting to buy 6Gigs VPS Plan, Is that promo still available now? Actually, I have some problems about Fraud Status and order cancelation proces also. Could you help me to solve that problems? What should I do ? The 6GB plan is still available, if your order was marked as fraud please submit a support ticket. Very happy with how quick the provisioning and support response times are. Purchased on 24 Jan, got it up and running in a few hours. Support was very responsive even on a weekend and I love that ! Alexander, I’d like to purchase another of the 6GB VPS, and I’m really happy the offers are still live, but available only in Atlanta. I’m looking to have another provisioned in either LV/Dallas, is there any chance of additional capacity being added to any of those locations for the same offer ? Thank you for the offer ! Glad you’re happy! We may have some additional Las Vegas / Dallas stock available, please create a sales ticket. Yesterday,I bought the 768MB vps,it looks everything is fine now,but I want change the data center to Los Angeles from Altanta,okay?? Sure, please submit a ticket if you are looking to move your VPS to Las Vegas. Is Los Angeles,not Las Vegas. We do not have a Los Angeles location. I’m using their 768MB VPS yearly, but somehow, my PHP-FPM and MariaDB goes down few times in a week, and I couldn’t find the reason. I have nginx+php-fpm+mariadb with the same configurations and setup on few others low end VPS, they run just fine, without any problem. So I don’t recommend anyone to this provider. Would you mind submitting a support ticket? We should have Dallas stock available by tomorrow. Dallas is back in stock now. I own a large hosting company with the name centiplex.com, and we work in the field of web-site designing and development. We have clients internationally and for the same, we always needed the servers which are high performance, low price. The most important thing for us was always quick response from the company support. bluevm – one of the worst vps company I have ever seen. Poor servers, poor management, support is worst. flexihosting – good company, very fast response, highly motivated team, great hardware and network, little bit on the costlier side, but in the end, you get what you pay for, and they are worth every penny, you invest in your servers. 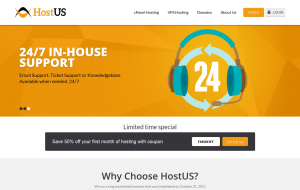 hostus.us – one of the recent company, I found and believe me, I am amazed with their price, the fastest response of their support team, very knowledgeable engineers, they know what they are doing. We purchased two servers from the company, initially we had some problems configuring the servers with them, even though we were on un-managed servers, but the company gave us out of limit support that too without any extra investment or single penny. I find their servers very reliable, cost effective, very wonderful staff. I would recommend hostus.us to anyone who are willing to buy new servers for their projects. Service is great, and control panel looks very professional. Hallo, i have paid in VPS Plan. i have open tickect #HUS-4778259 – “i have paid, please active my vps”. Your VPS has been provisioned. This ticket has already been replied to. Slow to reply to tickets. Ordered, Paid straight away via PayPal. PayPal didn’t return the API call so it’s still sat at pending. Issued ticket when it didn’t update to say paid. Overdue invoices sent to me and not replying to tickets. I’m sorry for any inconvenience that you may have had, please let us know should you need any further help. Please submit a sales ticket. Also in TOS I see Zpanel is banned. Do you accept this below?. Do you have any 2gb or 3gb ram, 2gb or 3TB bandwidth, offer?. I see that both of your questions have been answered by ticket. Please let us know if you have any queries. Please reply my ticket HUS-5085128 and my VPS order. Any ETA when Dallas will be available again ? It’s my first vps from this company I am very happy, so far all running well without downtime almost two months now, I recommend A+ service. Excuse me, is this VPS immediately opened? Still need to review? I just ordered a new vps from HostUS today, they manually review my order. Can I configure iptables and open ports on this server? Is it now $12 per year for the 768 MB package? May I know the 768MB plan speed to China? Any recommended free VPN I can setup on this server do you recommend? It is US$12 instead of US$10 to me. Why is it? Quite happy so far, though I haven’t done much aside from monitor it. I’ll be picking up a higher package to migrate my little websites to next time they have some sort of sale. Be mindful of packages that aren’t super recent though. Along with my little VPS, I just ordered a slightly bigger 2GB plan from another thread here on LEB. Everything looked good, but apparently the deal is expired and only comes with one IPv4 instead of the 3 that were advertised now. It doesn’t list an expiration date or have an “out of stock” page or anything, but according to tech support it’s expired and you can no longer have the other IP addresses. A little bait-and-switch-esque there. They did offer me a refund (which I declined), but it very much irritates me on principle so I had to share. Ordered 768MB for $12/annually – Washington DC; very happy so far. Selected wordpress prebuilt configuration, performance seems good, reliability also good. Had a bad experience with cloudatcost.com; don’t waste time with this VPS. Yes they do! I’m with them for only a week and so far the VPS is amazing! Yes they do! Their service seems to be really good! Had no problems yet. Is the website down? I’ve been trying to pay my bills since yesterday morning and it’s the same. Could someone from staff check this please? Nevermind, it is done, might be a little issue at provider end. Site is accessible now. Price of 768MB plan seems to be $16/year now. Do you have any promos/offers for your reseller hosting with dedicated IP (starter or premium). I don’t care about WHMCS license. In this vps supports to hosting game server?